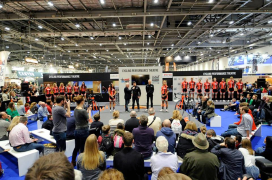 LONDON, UK – The UK’s largest cycling Show returns to ExCeL London from 12 – 15 February. Over 200 exhibitors are present including a number of retailers that are not only launching their latest products but also sells them to the public. Brands confirmed to be at the Show include Cannondale, Boardman, Scott, Giant, Colnago, Vulpine, Canyon, Hoy Bikes, Mavic, Raleigh, Santa Cruz and Schwalbe, whilst retailer TriUK will be present offering bike fitting and some great offers. This year, the Cycling Performance Theatre – Sponsored by British Eurosport is set to deliver the best line up of special guests the Show has ever welcomed. Guests currently include Great Britain’s most successful Olympian Sir Chris Hoy, 2-time Tour de France winner Greg LeMond, downhill MTB legend Steve Peat and Team Wiggle Honda Manager Rochelle Gilmore. The 500m BikeEtc Test Track will return to the Show for another year, allowing visitors the opportunity to try a whole range of road bikes, commuter bikes and the latest electric bikes. There will also be a dedicated kid’s test track for the younger ones to try out the latest bikes on the market. Next to the Theatre and Test Track the organizers have added a host of new attractions, including the Training & Safety Arena and the StreetVelodrome.